These gloves are the perfect addition to any knight's costume. 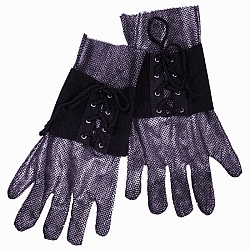 Gloves are made of black mesh with silver speckles to give you the look of chain mail with out the weight. The medieval chain mail knight's gloves are 10" long and include medieval style bracers with string ties.